July 02, 2013 - "Applications "
Today, the term “efficiency” can be interpreted in a variety of ways, such as combustion efficiency, thermal efficiency, fuel-to-steam efficiency, etc. By definition, “efficiency” is “the measure of a machine's energy effectiveness” or “the amount of energy used by a machine to the amount of work done by it” as shown in Figure 1. For example, the amount of heat [energy] produced per unit of fuel when all of a fuel has been burned is a measure of a steam boiler’s efficiency. When evaluating a steam boiler, one should understand the variable factors that influence a boiler’s operating or “in-service efficiency” under all operating conditions of the steam plant. No “fuel” fired boiler operates at 100% efficiency. The energy lost [unused] comes in several forms. The greatest relative source is the exhaust gases from the process of combustion, which can decrease efficiency by 18% or more. The next area of loss pertains to the heat that is radiated from the boiler, whether operating or in standby mode, which can result in losses up to 4%. Too frequent blowdown cycles can cause as much as 3% or more in heat loss. As one can see, reducing [or recovering] the losses of radiation, blowdown and flue gases will increase the operating efficiency of the equipment. The final boiler selection should be evaluated on what the vendor can provide to reduce these losses and increase the operating efficiency of the boiler. Overall system design should also consider the piping losses, proper insulation of the steam system, wasted or returned condensate, system operation, etc., as these factors also combine to determine the cost of each pound of steam produced. Aside from the energy losses, one also needs to consider the location of the steam boiler. Is there sufficient space for service and maintenance of the equipment on the fireside and waterside? Sufficient head room for overhead piping? If space is limited, will the reduced floor space interfere with equipment access to perform yearly maintenance and inspection? If space is limited and the equipment is not designed for easy access, service, and tube replacement, properly maintaining the equipment will be difficult, which can lead to increased operating costs and reduced life expectancy of the boiler. Decidedly, boilers do not operate at a static condition or at one specific firing rate for a typical steam demand requirement. Changes in steam demand, inlet feedwater temperature, blowdown cycles, chemical treatment, radiation losses from the equipment during operation standby, excess air settings, combustion air temperature, ambient room temperature, burner load tracking ability, fireside cleanliness, and waterside cleanliness all influence the “in-service” efficiency of the boiler and ultimate production of steam at a reasonable cost. Each of these “influencers” determines the efficiency of the boiler to produce each pound of steam to the system. Yet, other factors such as electrical consumption, steam piping, condensate return, and maintenance costs will also factor into the overall cost of efficient steam production. Quick Load Response – this should not be confused with cold start-up when the boiler has been off line and no pressure exists within the vessel. Frequently a boiler is selected based on how quickly it will cycle on from a cold start, meaning no pressure on the boiler and internal water temperature is at ambient. While low water volume boilers may be brought to steam pressure in a very short period of time, rarely are steam loads a batch process where steam boilers cycle off and cool down before the next steam demand. Changing steam loads require that a boiler follow these fast load changes without an excessive change in steam quality or drop in steam pressure. High Turndown – the boiler must be equipped with a burner that can consistently achieve modulation from minimum to maximum firing rate with consistent fuel/air ratio as the steam demand changes throughout the daily demand. A high turndown burner will minimize on/off cycling [efficiency loss] and maintain steam flow and quality regardless of system demand. For example, a 100 HP boiler with 10:1 turndown can operate with a minimum output of 10 HP, while still maintaining high efficiency. 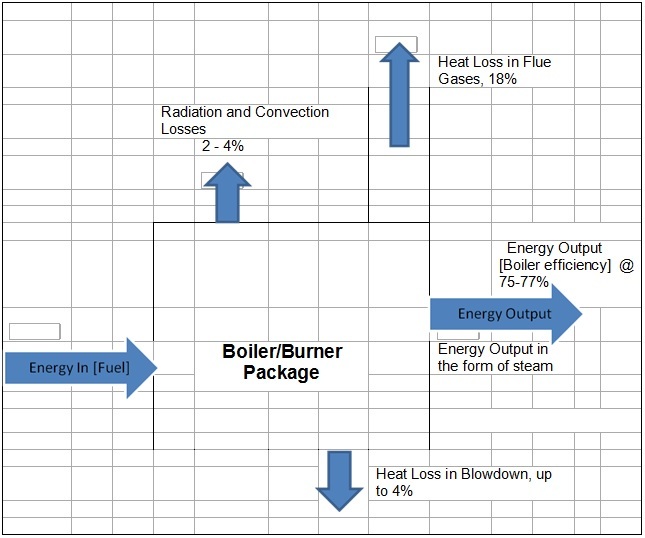 Some “on/off” boiler manufacturers try to approximate modulating high turndown boilers through “modular” configurations but cannot operate efficiently where variable steam loads occur. Consequently, one should ascertain whether the selected boiler has the ability to operate efficiently at minimum or mid-fire input rate without on/off cycling or excessive excess air. It should be noted that steam loads are rarely operating at the “on/off” or “low/high/low” firing rates of the modular units so frequent cycling will occur on non-turndown boilers. Fireside/Waterside cleanliness contributes to effective heat transfer. A design that offers ease of access for inspection and cleaning will contribute to favorable efficiency. Generally, low water volume boilers require intense water treatment, and variables in the treatment program can lead to rapid scaling and a significant decrease in heat transfer efficiency. Likewise, if the fireside is difficult to access, inspect and clean, it will become an area that is too often neglected, which results in a decreased energy transfer. Maintenance – proper maintenance includes bottom blowdown, surface blowdown, water conditioning, control functionality, fuel burning components, water feed equipment and control. Thus, equipment design contributes to this function being easily performed. Is the burner easy to access at a normal work level? Is it easy to open and inspect without having to disassemble part or all of the major components? How frequently must the boiler be subjected to bottom or surface blowdown? The greater the frequency of blowdown, the greater the heat losses. How easily can a failed/compromised tube be replaced? If a tube replacement cannot be done at a reasonable cost, the entire heat exchanger may have to be replaced instead, which increases the life cycle cost of the boiler. Water Quality – While low-water volume, low-mass boilers may produce steam quickly, the water quality must be exceptional to avoid scaling and sludge build-up. For example a 100 Hp boiler with a generous heating surface and water volume is less prone to scaling and corrosion compared to a unit that has half the heating surfaces and a third of the water volume. Each square foot of the heating surface must evaporate 11.5 pounds of steam. If Boiler A has 500 square feet of heating surface and Boiler B has 250 square feet, Boiler B will have a greater occurrence of solids concentration due to its smaller heating surface. A boiler with a small heating surface requires more frequent blowdown to maintain proper cycles of concentration and increased chemical make-up. The boiler room footprint should be a consideration during product selection. Installing a product that is difficult to service, inspect, or repair due to limited access space can lead to higher overall maintenance costs. The generous heating surface of a Firetube boiler is the most efficient boiler without an economizer; however limited space may preclude its selection. In the case of a small boiler room, a Flex-Watertube (or Flextube) design should be considered. The Flextube boiler does not require additional space for tube removal, keeping tube surface maintenance area to a minimum on each side. The Flextube boiler is on line within minutes from a cold start and with a full modulation burner [up to 10:1 turndown on Gas Fuel] and proportional level controls, it tracks the steam load efficiently with steam quality of 99.5%. Enhancements to the basic Flextube package can include: an economizer to increase operating efficiency and decrease fuel consumption; linkageless controls for reduction in air/fuel ratio maintenance, superior load tracking and a reduction is excess air levels; and blowdown heat recovery and feedwater treatment packages from the simple feedwater tank to a more sophisticated deaerator package. These enhancements can increase in-service package efficiency to more than 85%. The Firetube boiler requires boiler room length extension for tube removal; however, maintenance area on the boiler sides is minimal. Newer Firetube designs have reduced water volume allowing for a 25% reduction in response time compared to “traditional” Firetube boilers. Turndown of 10:1 on gas fuel enables the boiler to follow load requirements without boiler cycling. Cycling reduces boiler efficiency. Steam quality of 99.5% is easily maintained without the requirement of a steam separator. Firetube boilers without heat recovery have the highest efficiency, and adding an economizer will enhance operating efficiency and decrease fuel consumption and emissions. Linkageless controls will increase the operating efficiency of the Firetube boiler. Add to this blowdown heat recovery and a sophisticated deaerator package, and in-service package efficiency increases to more than 85%. In summary, consider the total cost of ownership. Choose the boiler that is highly efficient, has a load tracking capability, and is easy to operate and maintain.